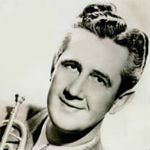 Clyde McCoy (December 29, 1903 – June 11, 1990), was an American jazz trumpeter whose popularity spanned seven decades. He is best remembered for his theme song, “Sugar Blues”, written by Clarence Williams and Lucy Fletcher, and well as the co-founder of Down Beat magazine in 1935. McCoy was a member of one of the families of the Hatfield-McCoy feud, and was based at various times in Los Angeles, New York City, and at Chicago’s Drake Hotel, where he first performed “Sugar Blues” in 1930. He has a star on the Hollywood Walk of Fame at 6426 Hollywood Boulevard.